The Samsung 85mm f1.4 portrait lens is ideal for creating stunning, expressive portraits. In addition to featuring an ultra fast aperture of f1.4, it contains a Supersonic Actuator(SSA) for silent, fast auto focusing. It also features full-time manual focus so you can instantly override the autofocus for the aesthetically pleasing background blur you desire. The intuitive i-Function feature gives users one-touch access to all your camera's manual settings. Adjust the aperture, shutter speed and more with just a twist of the lens while previewing the image in real-time. 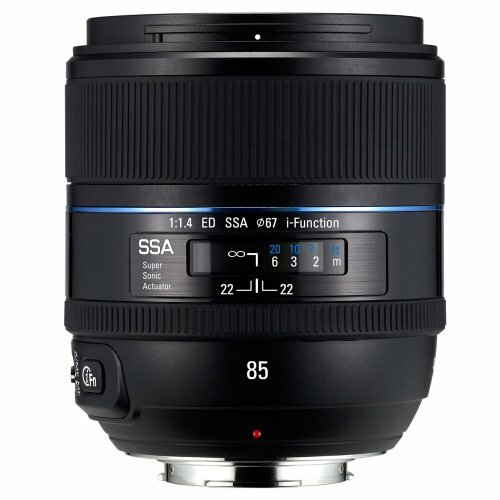 This 85mm f1.4 portrait lens is compatible with all Samsung NX Compact System Cameras. Includes the intuitive i-Function technology which allows users to adjust the camera's manual settings and preview the image in real-time.